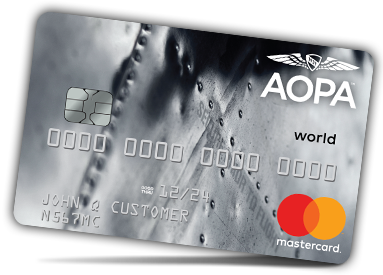 Start earning Cash Back1 with the NEW AOPA World Mastercard and stop paying too much on your aviation purchases. ** Fuel includes both aviation and auto. Revenue from AOPA Products & Services goes right back to supporting, growing and protecting general aviation. Rewards points can be redeemed for Cash Back or other redemption items provided through AOPA Pilot Rewards. A Cash Back redemption is applied as a statement credit. The statement credit will reduce your balance but you are still required to make at least your minimum payment. A minimum of 2,500 points is needed to redeem for Cash Back. Values for non-cash back redemption items such as merchandise, gift cards, and travel may vary. Advertising, Aviation Insurance, PAC Donations and AFI Donations are excluded. Visit www.commercebank.com/aopapilotrewards for complete details on exclusions and bonus point categories. Please note that merchants self-select the category in which transactions will be listed and some merchants may be owned by other companies, therefore transactions may not be counted in the category you might expect. Purchases made using Near Field Communication (NFC), virtual wallets, or similar technology may not be eligible for bonus points. You will earn 4% Cash Back (1 regular point + 3 bonus points = 4%) for every $1 of Net Merchandise Purchases on select AOPA purchases, 3% Cash Back (1 regular point + 2 bonus points = 3%) for every $1 of Net Merchandise Purchases made at select AOPA partners, 2% Cash Back (1 regular point + 1 bonus points = 2%) for every $1 of Net Merchandise Purchases made at FBOs (fixed based operators), aviation and auto fuel, and flight schools, and 1% Cash Back (or 1 point) for every $1 of other Net Merchandise Purchases. For example, if you spend $100, you will earn 100 points which is equal to $1 in Cash Back rewards. A maximum of 2,000 bonus points will be awarded per calendar quarter, per rewards account. Please allow up to five business days after the transaction posts to your account for bonus points to be awarded. Certain terms, conditions, limitations, and exclusions apply. See your guide to benefits for details. Subject to credit approval and eligibility under applicable law. 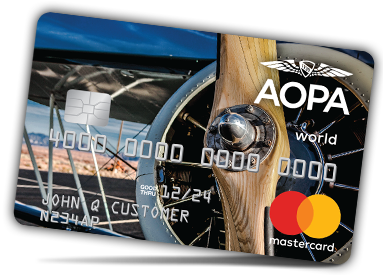 By applying for the AOPA World Mastercard®, you are authorizing Commerce Bank to share information with AOPA to fulfill on the Unique Cardholder Gifts. Periodically AOPA will provide special offers and gifts to cardholders. Offer subject to change without notice. Select AOPA purchases include: AOPA Membership, Pilot Protection Services, AOPA Flight Instructor Refresher Clinics (in-person and online), AOPA Event Registration, AOPA Pilot Gear store purchases.